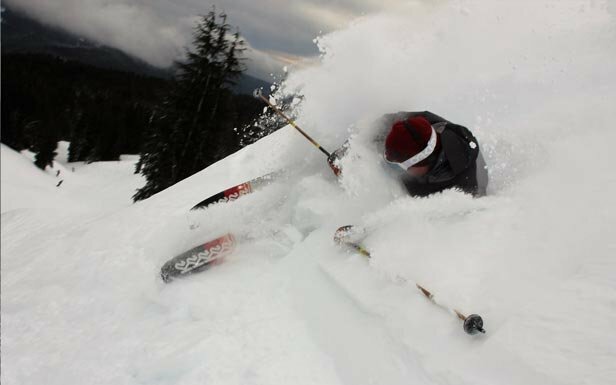 It’s the storm that just keeps on giving - a perfectly timed powder punch just in time for the holiday week at Mt. Hood Meadows. Powder pursuers received free refills during the course of the storm, and the night riding was especially delightful. Meadows reports a base area depth of 61 inches and 92 inches at mid-mountain. The storm started around 10 PM Saturday and isn’t done yet as the forecast says a few more inches will fall today. Meadows lifts are scheduled from 9 AM - 4 PM Christmas Eve, and then 9 AM - 9 PM daily for the holidays, with two exceptions: New Year’s Eve hours are from 9 AM - Midnight and New Year’s Day hours are 9 AM - 4 PM.